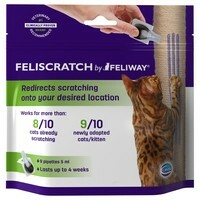 Feliscratch by Feliway is a unique solution to redirect scratching to a desired location or to encourage a newly adopted cat(s) to use a scratching post. Scratching, while a normal behaviour in cats to mark territory and keep their nails trim, can also be a sign of anxiety due to changes in the environment or conflicts with other cats. Feliscratch works by combining three key ingredients that work in synergy. Pheromones – A synthetic copy of the pheromone message that directs scratching to the surface where it has been applied.